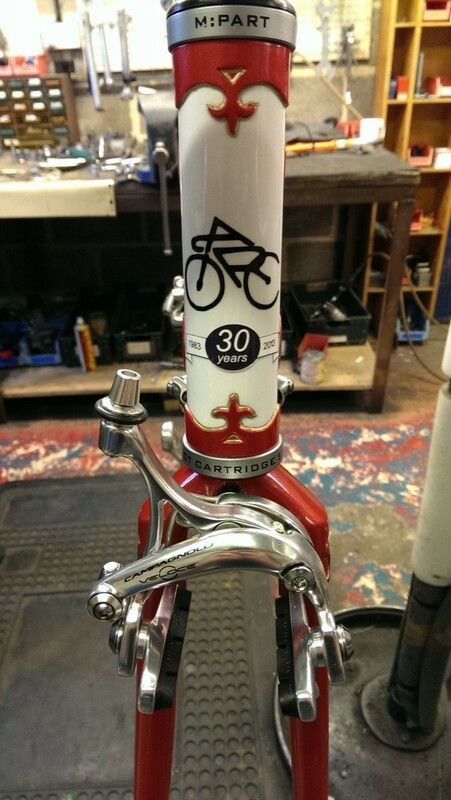 Arthur Caygill Cycles has been established for over 30 years. 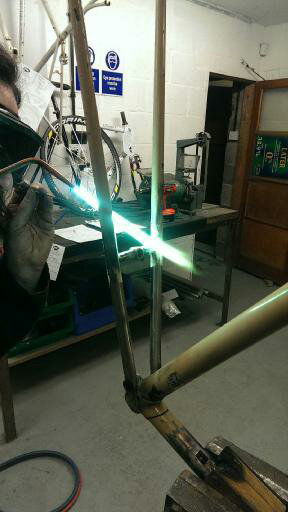 Historically and present day we manufacture quality frames in our own on site workshop so as to meet customer requirements dependent upon their shape and the type of cycling they will be doing. 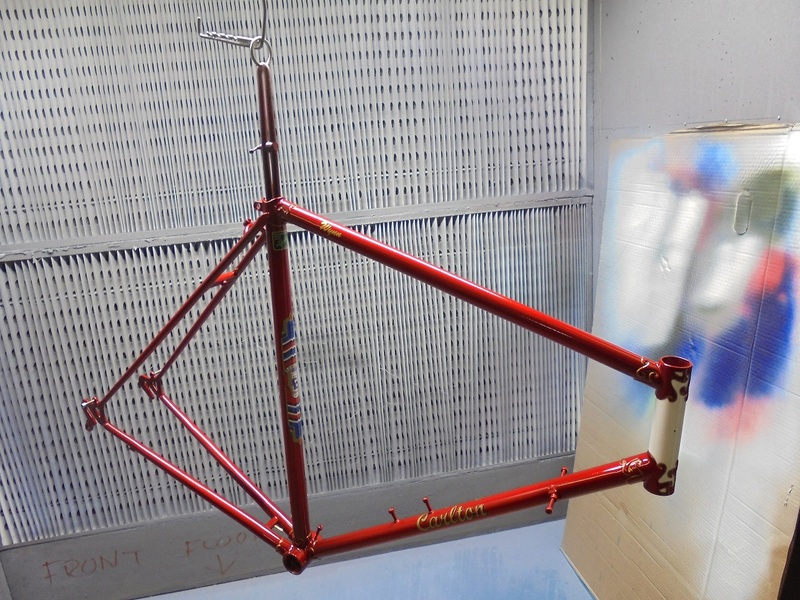 Each customer who opts for a made to measure frame is given our full attention; they are physically measured and their requirements are discussed. 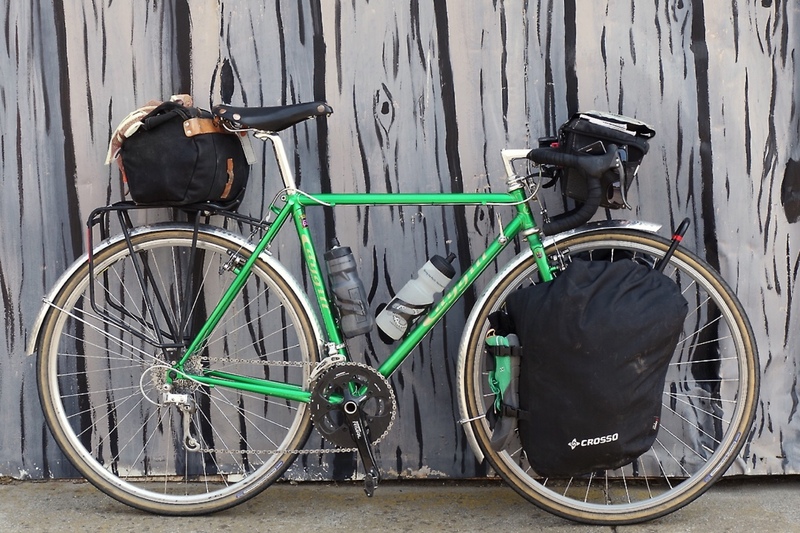 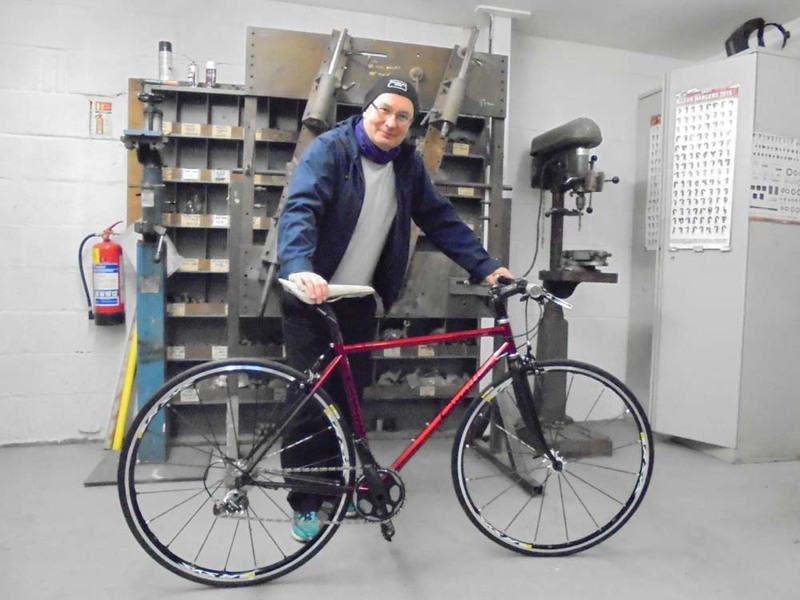 Advice is offered based on a wealth of experience; Arthur has been very much in the thick of the racing scene for much of his life and continues to be an avid cyclist, so knows what makes a bicycle frame perform. 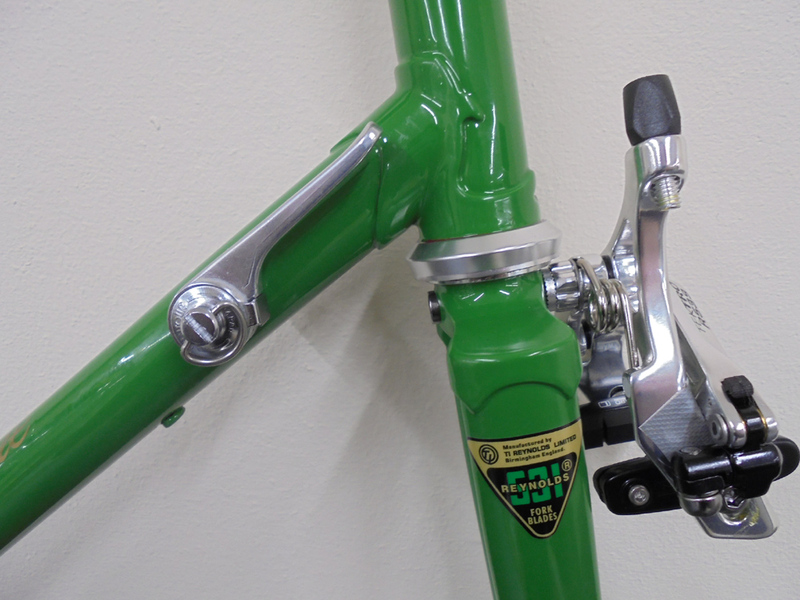 Customers are offered information regarding frame tubing, lugs, drop outs and braze-ons; they can see first-hand the differences between frame component parts. 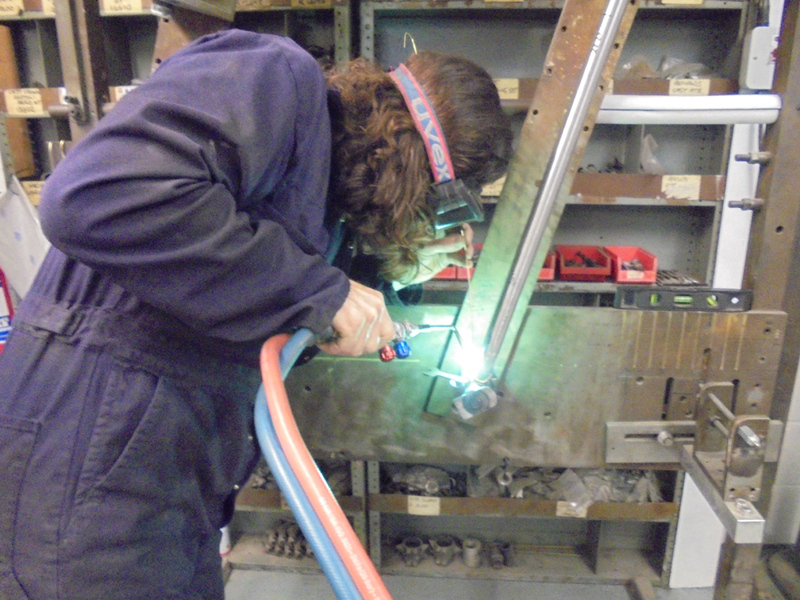 The good range of tubing and investment cast lugs held promotes informed decisions to be made. 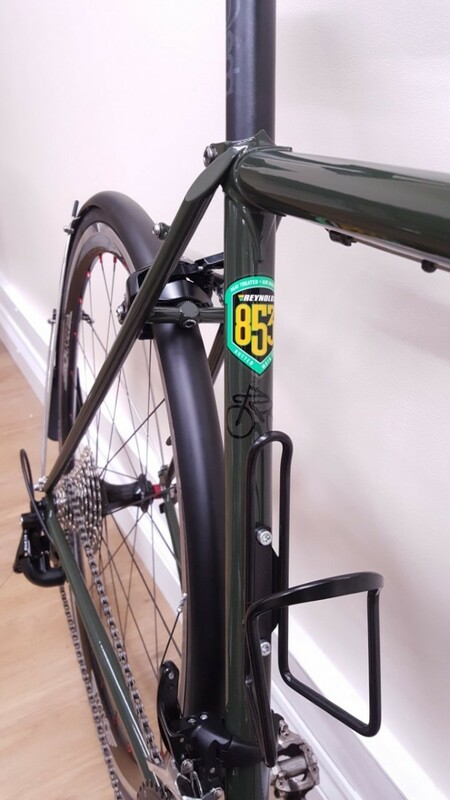 Ensuring the customer is clear and content with all details is paramount to us at Caygill's, including finishing colour and any decal detailing. 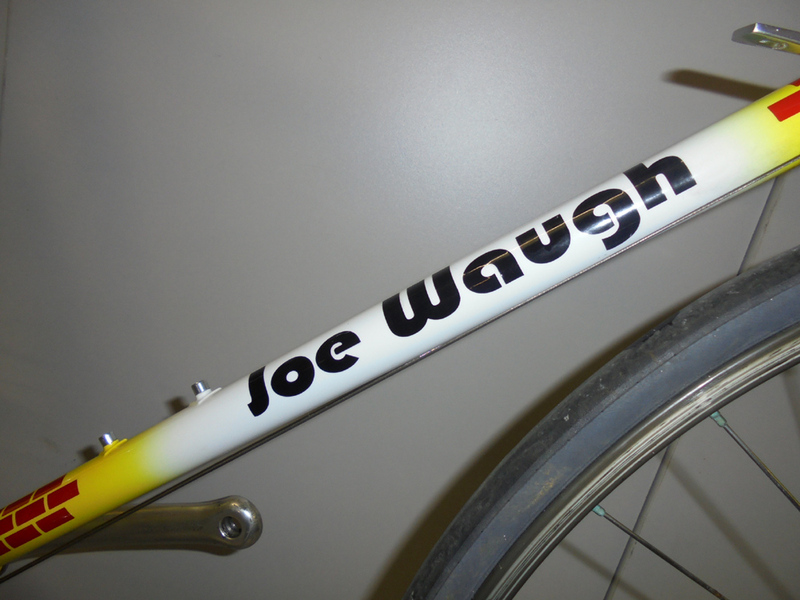 We can cater for almost any finishing and decal requirement from single and multi coloured paint options to name and logo graphics. 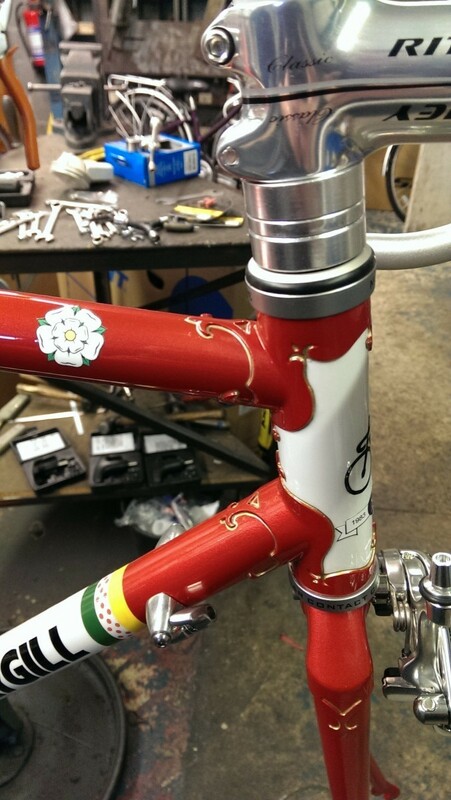 Although we endeavour to replicate colour schemes and Decals, it should be understood that it is not always possible due to availability of exact matches. 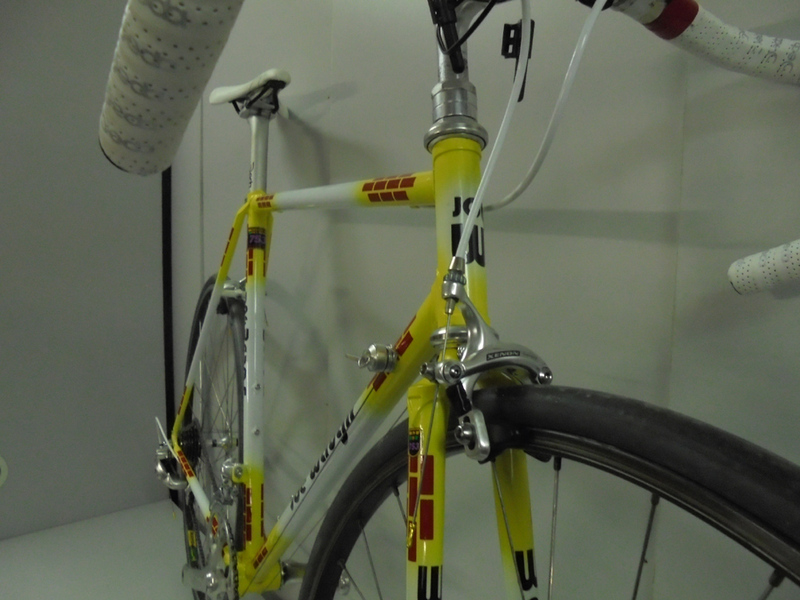 All relevant information is captured on a ‘frame design sheet’ and kept for construction purposes and customer historical records. 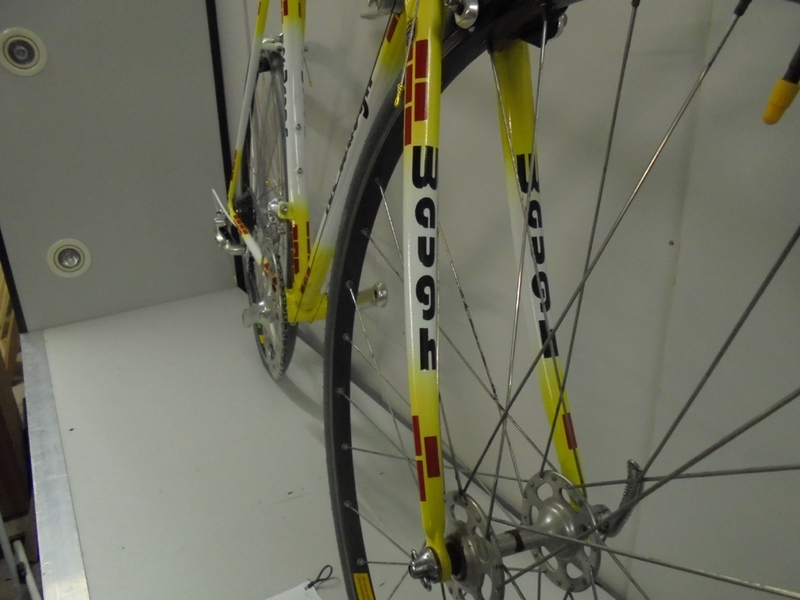 From the request date, delivery date is often several weeks however we will always endeavour to meet any timescales. 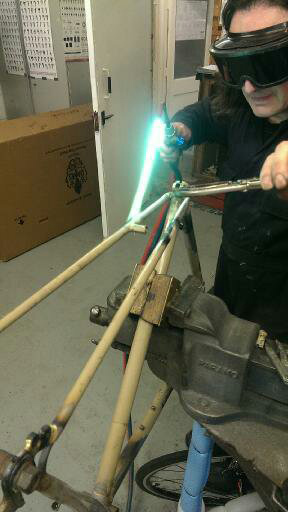 Moving forward, work can now begin on frame manufacture. 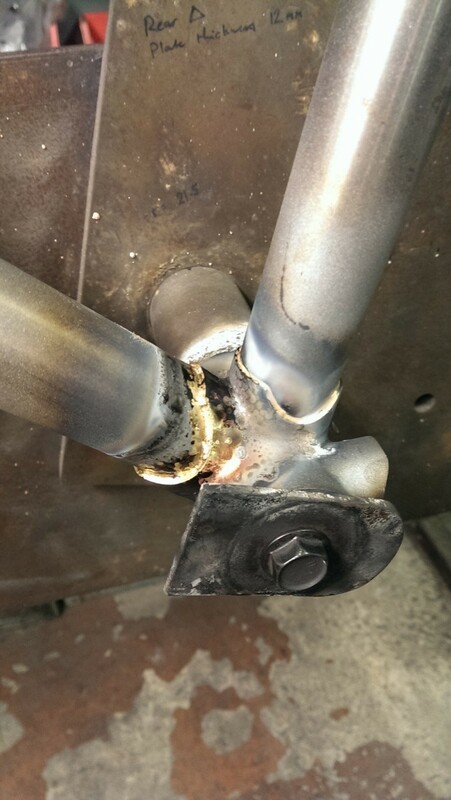 Each process is meticulously carried out; mitres are hand filed, tubes and lugs are cleaned and bead blasted and all measurements checked and re checked before any brazing occurs. 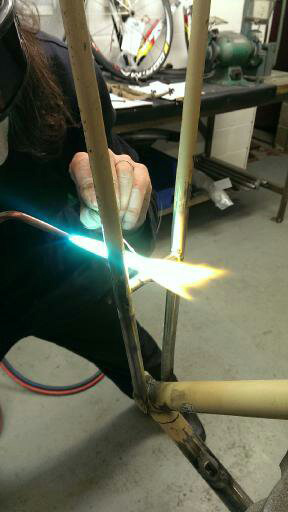 All brazing work is predominantly carried out on a frame jig after individual tubes have been perfectly hand crafted. 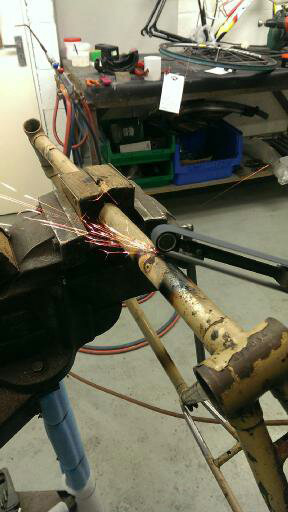 Generally Caygill frames are constructed by first manufacturing a series of sub assemblies, this approach has proved totally successful in ensuring that vital accuracy is achieved, allowing individual joints to be concentrated upon. 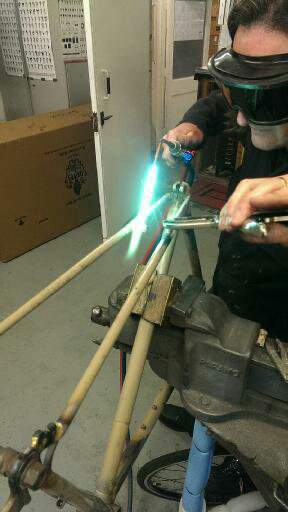 Briefly the process is as follows. 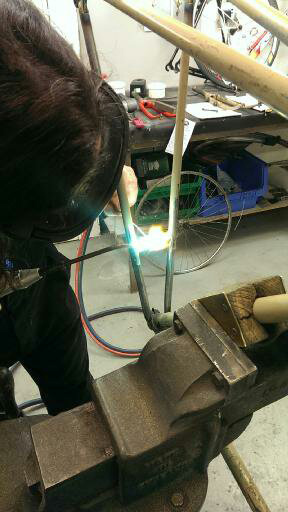 The mitred top tube is joined to the head tube, set at the chosen angle. 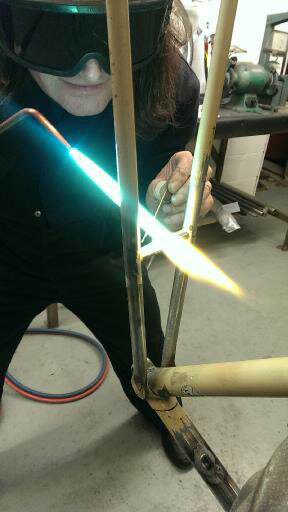 The seat tube after considering its final length being mindful of its butted section is brazed into the bottom bracket shell. 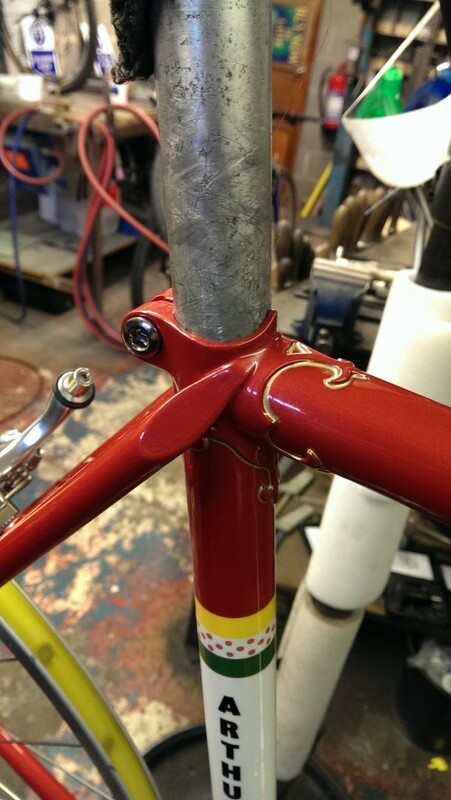 The top tube second mitre is filed to fit to the seat lug and seat tube at the required length and angle. 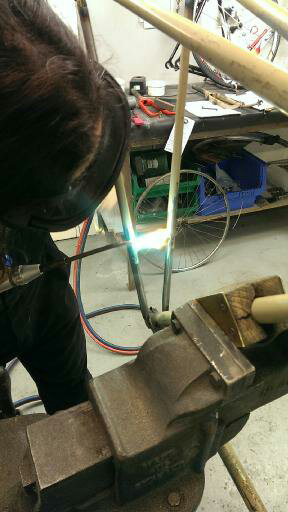 The down tube is now filed accordingly so as to be mitred to fit the head tube of the suitable length and give correct protrusion into the bottom bracket shell for maximum strength. 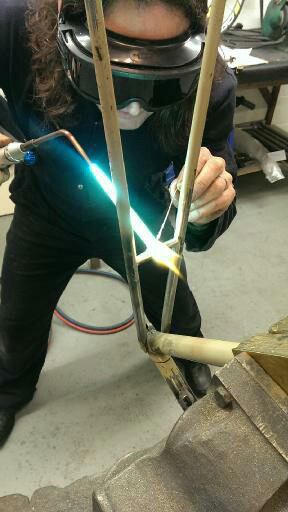 Once measurements and fit are checked and confirmed and cleaning and fluxing is carried out, the ‘main triangle’ can be brazed, again in the jig. 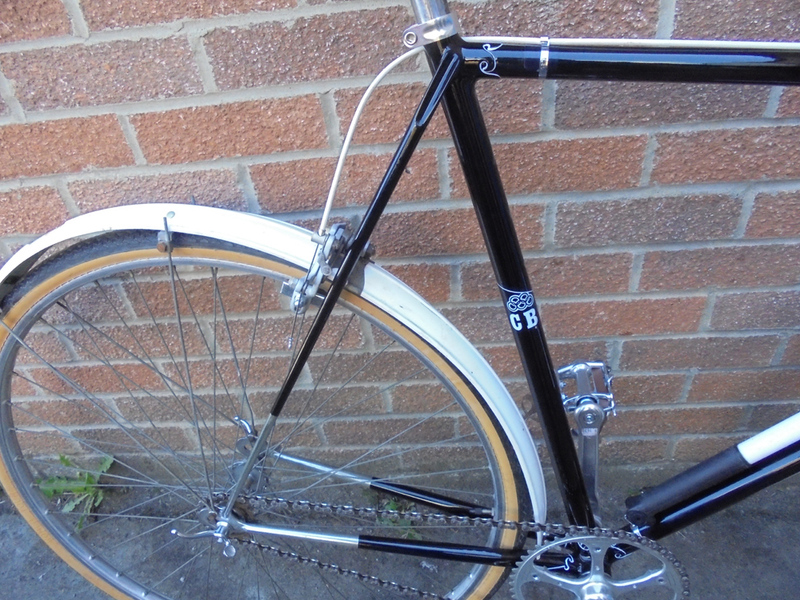 Attention is now given to the other sub assembles; the chosen drop outs are fitted into the chain stays, drop outs fitted into the fork blades and the steerer tube fitted to the desired fork crown. 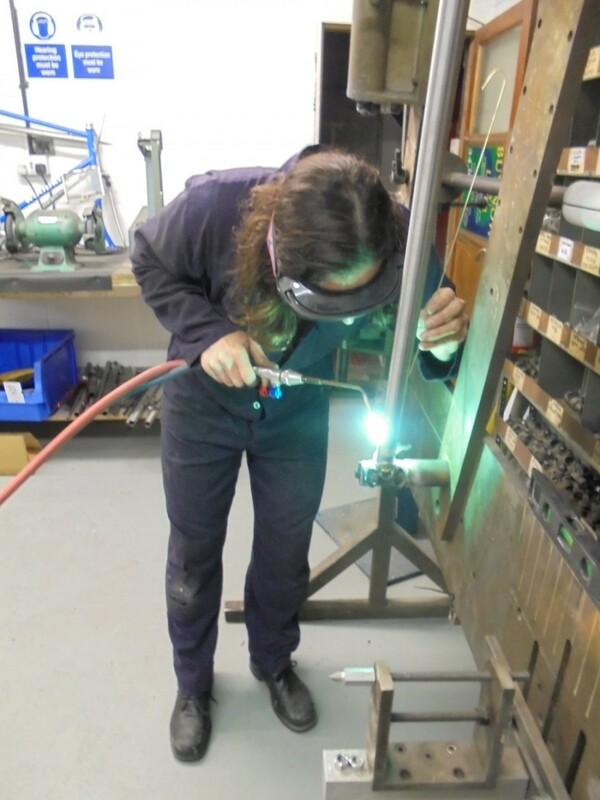 Utilising the jig, the cut to length chain stay sub assemblies are set at a measurement in correspondence to the central horizontal datum line through the bottom bracket shell, this give the bottom bracket drop and ultimately the bottom bracket height on the road. 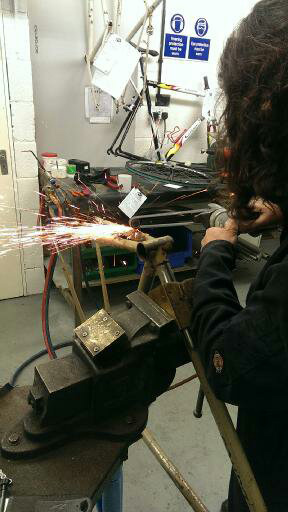 Once the chain stays are brazed in place it can be seen that the seat stay length is pre determined. 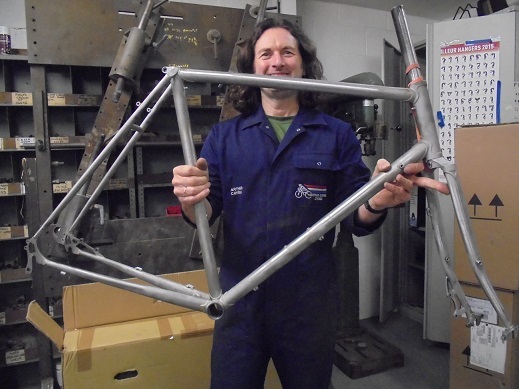 There are many details remaining to complete the frame but we hope this gives an insight to the work and care taken to produce your hand crafted frame that will last providing many years of service. 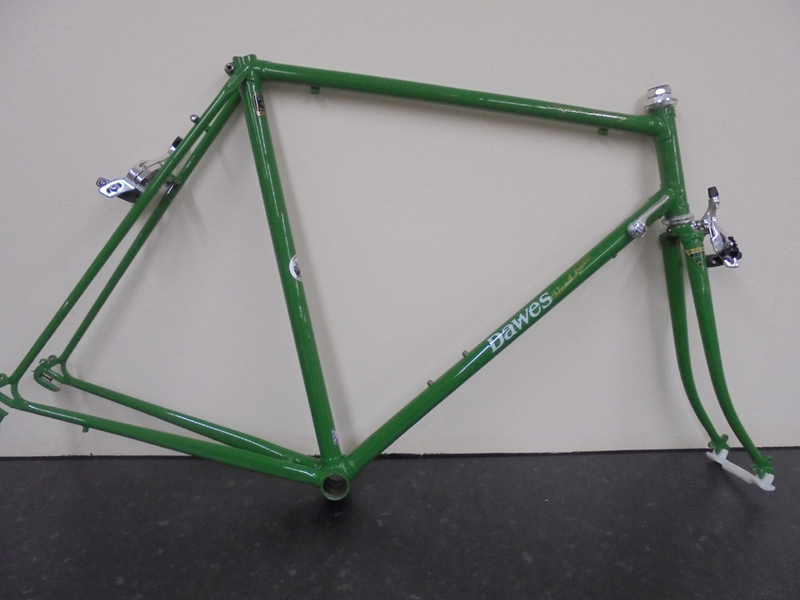 Frames manufactured recently have included those for a gentleman with a 38 inch inside leg and another frame to suit a rider required a 25 inch top tube even though the seat tube was a more typical 21 inches. 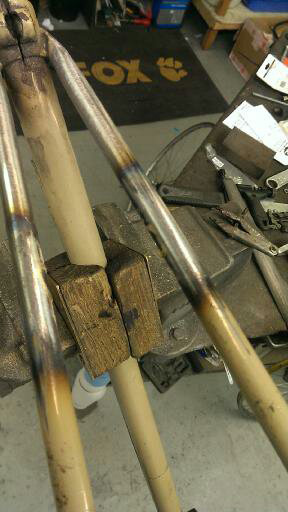 These are just examples of what can be done. 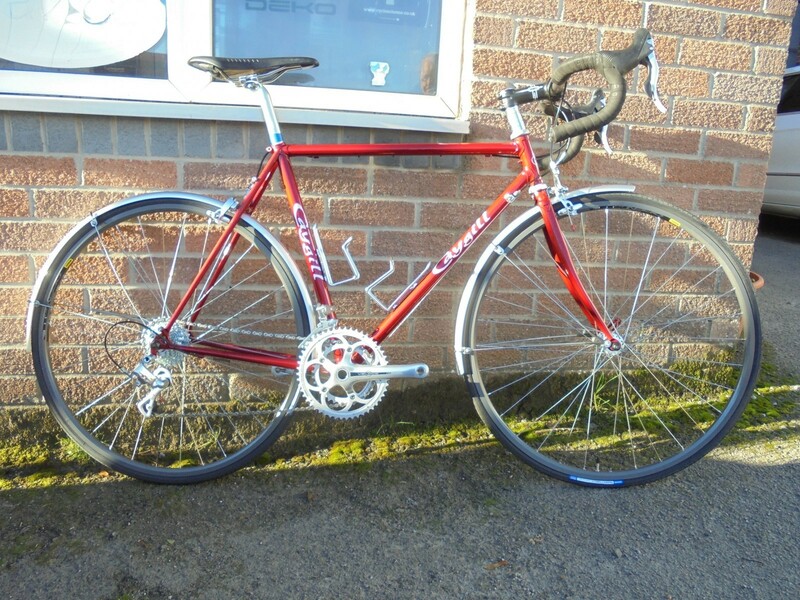 Previously we have proudly sponsored Chris Hopkinson. 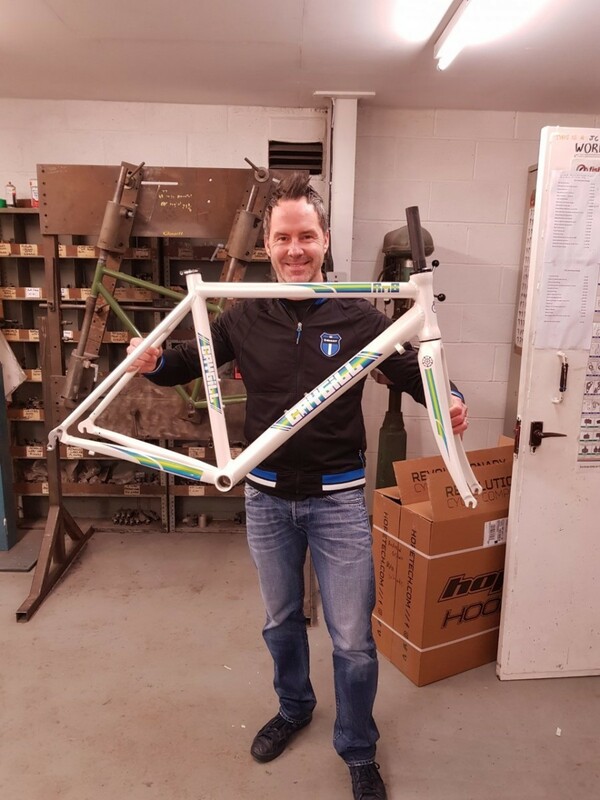 Amongst many things Chris has achieved a win at the Seibring 24 hour event, set records at the UMCA London to Cardiff and the Cardiff to Edinburgh and also won the Ireland 12hr. 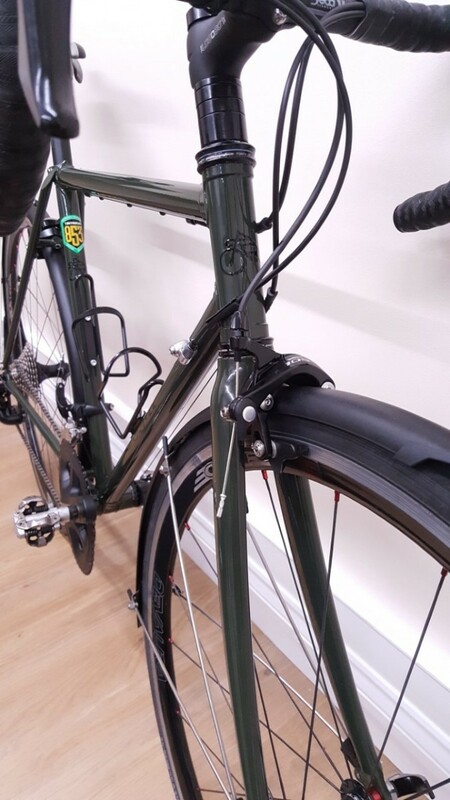 Chris rides Caygill custom built bicycles incorporating Caygill frames that have been made to measure, to position Chris where he wants to be and so maximise efficient use of his ability. 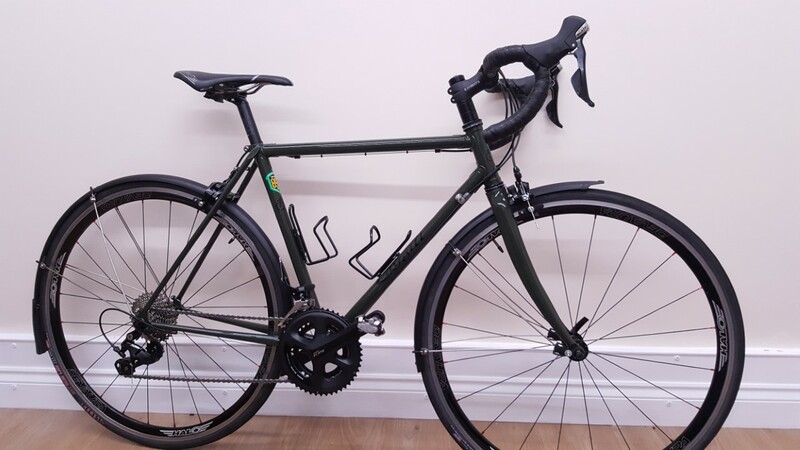 Caygill Cycles has successfully supported racing teams and individuals and built numerous frames of varying natures for touring and all aspects of cycling. 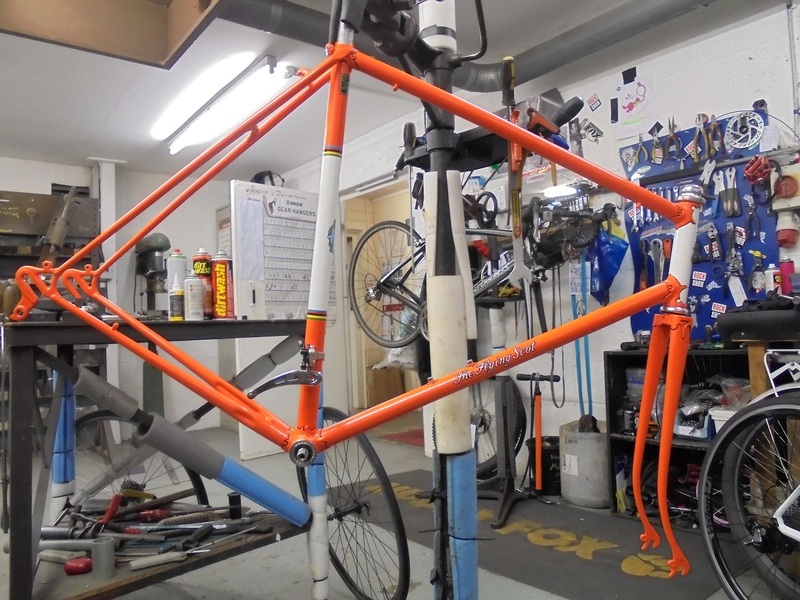 Therefore we firmly believe that if you are looking to a replacement frame we can offer a comprehensive frame building service that rest assured will give the results you are looking for. 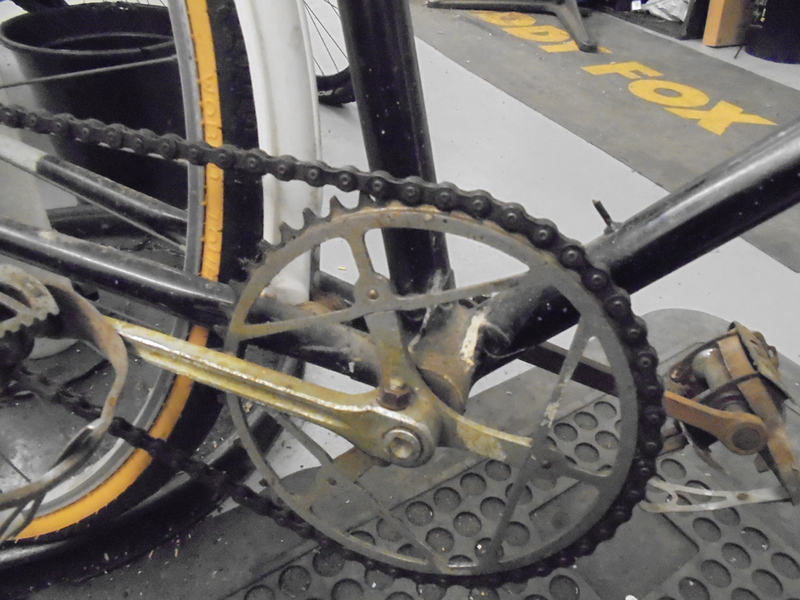 Whatever your problem, from a squeaky brake to a buckled frame, we can repair any make of cycle in our fully equipped workshop at Arthur Caygill Cycles. 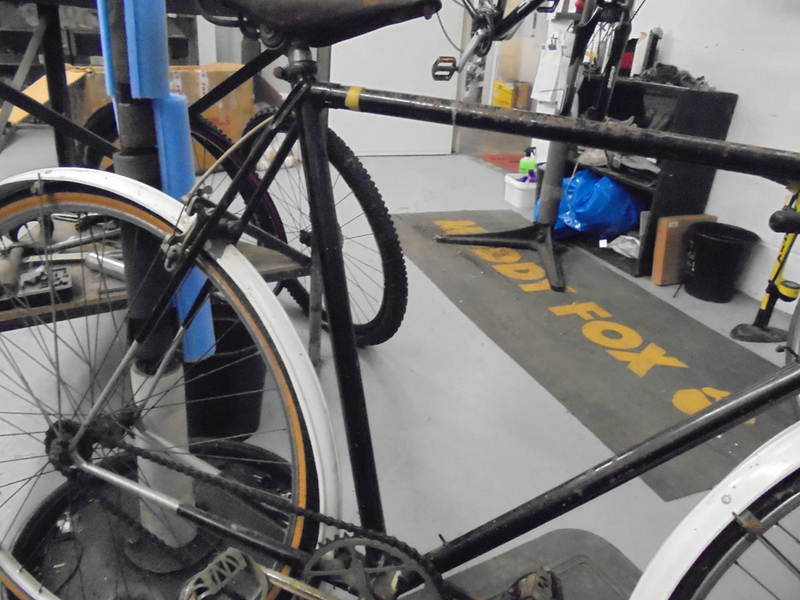 We also service and adjust suspension forks and hydraulic brakes. 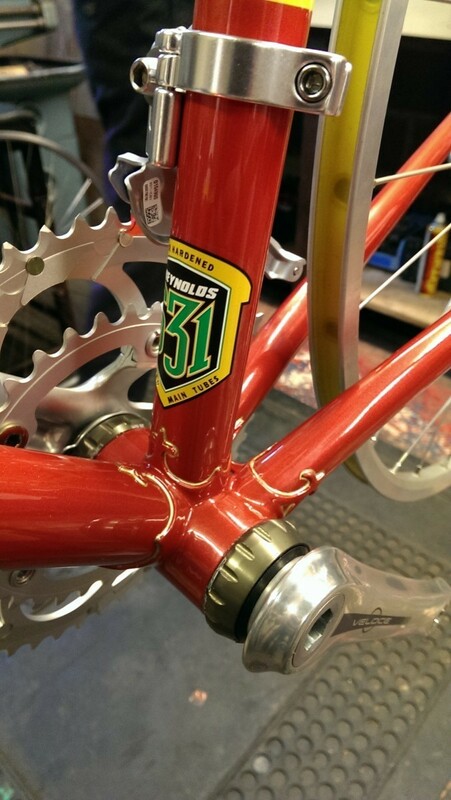 Why not have us completely renovate your bike if there's no way you can bring yourself to part with your trusty old frame? 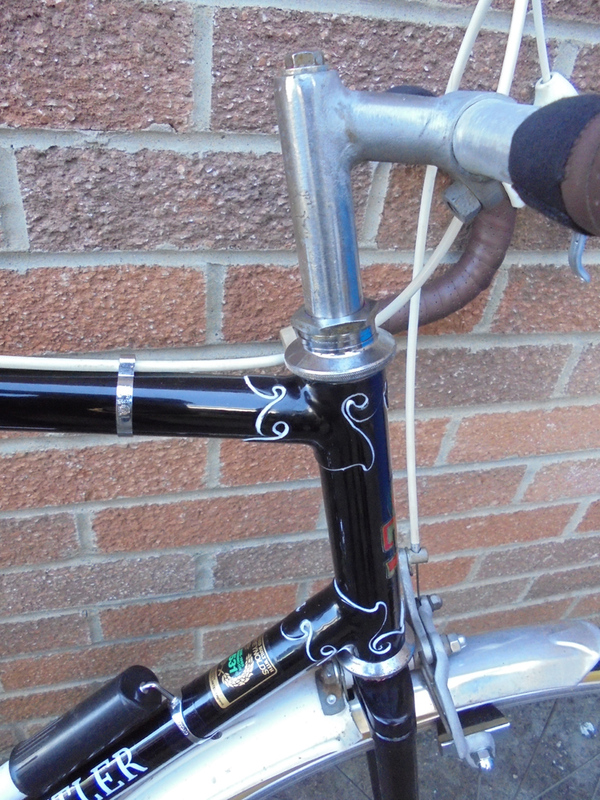 Give it a new lease of life and see how long it is until lugs become fashionable again! 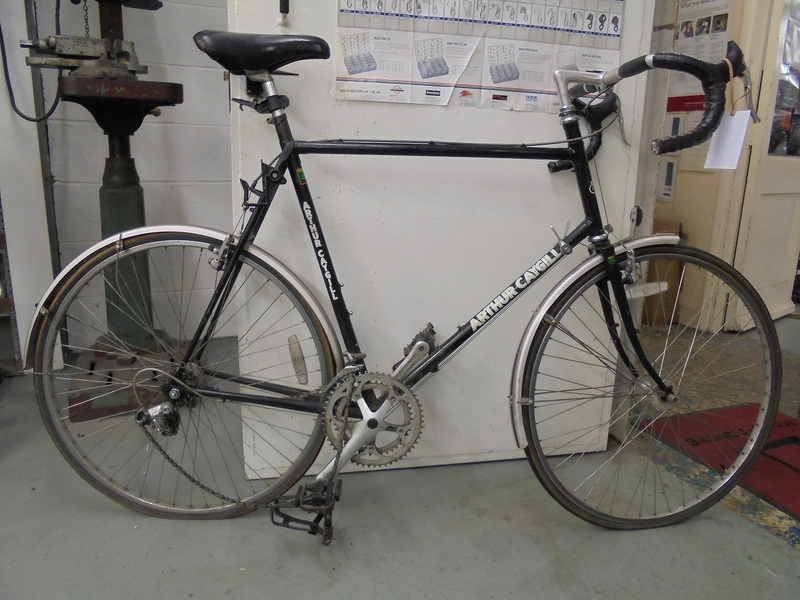 The bicycle renovation service offered at Arthur Caygill Cycles looks to provide customers with various options. 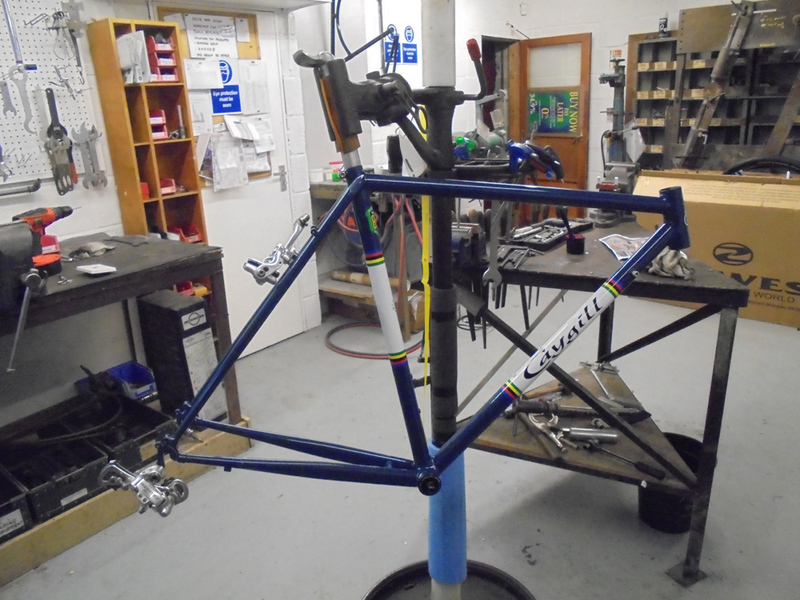 – We can carry out full bicycle strip-down; frame respray and component part degrease servicing and refit. 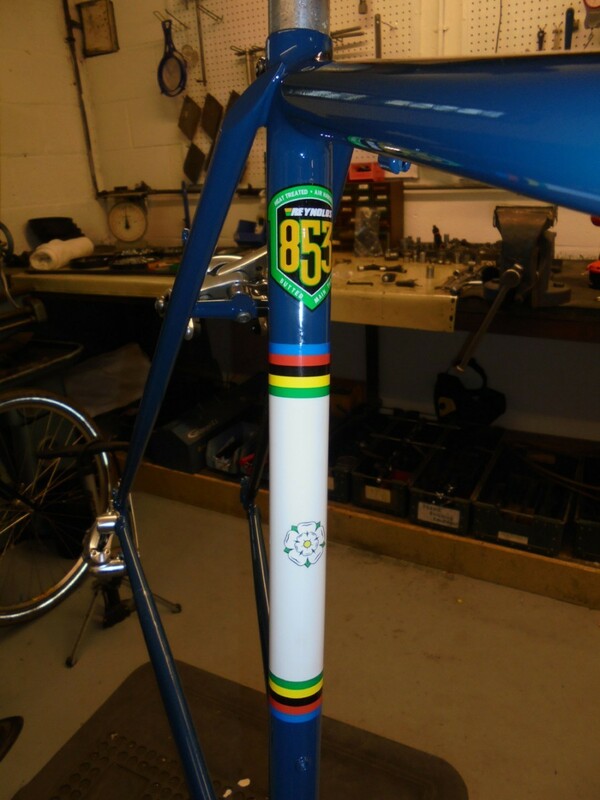 This will certainly bring your bicycle to its former glory. 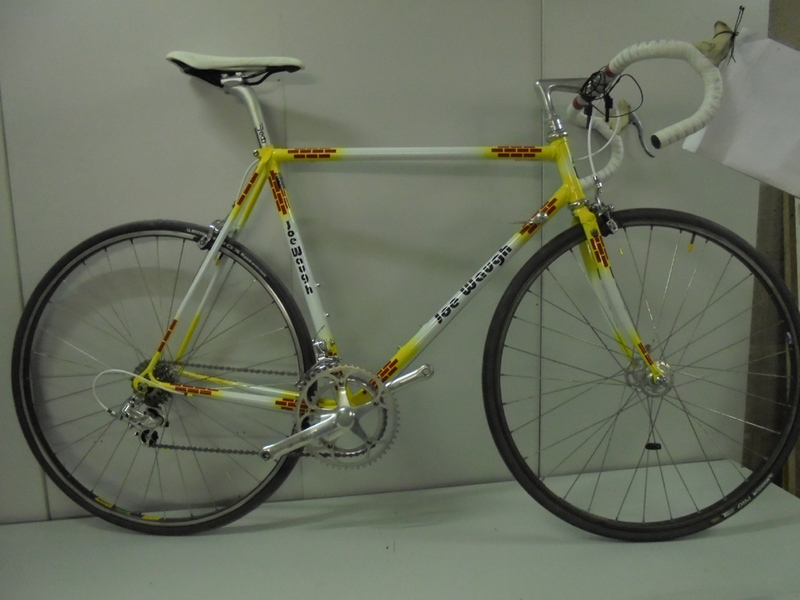 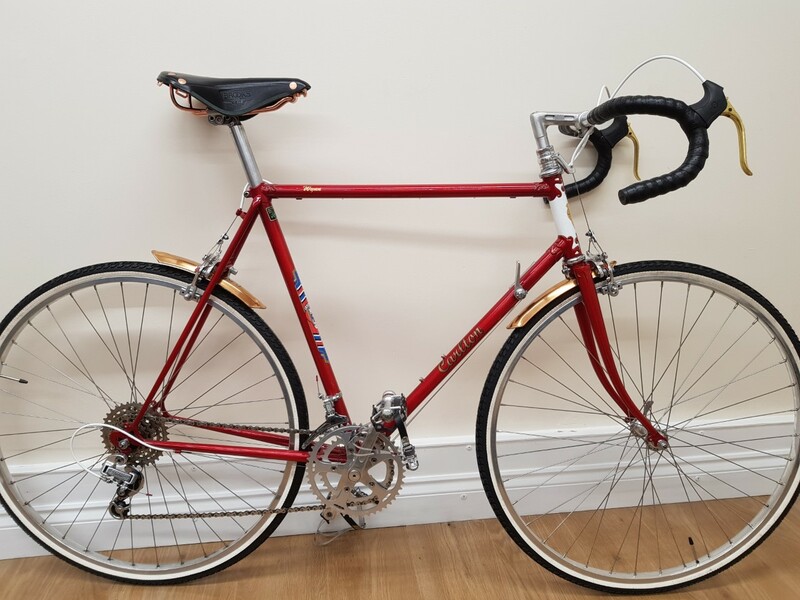 At Caygill's we understand your bicycle could be of sentimental value and you may just wish to refresh its appearance whilst retaining its originality, this is of course your choice and something we would be able to help you with. 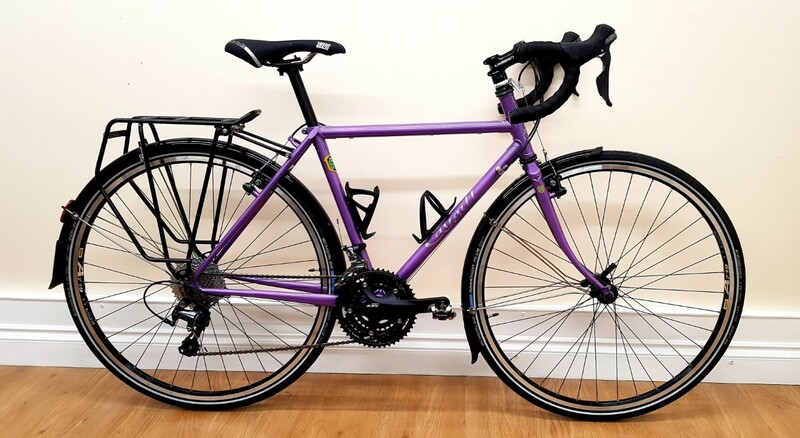 – If however you wish to replace component parts to update your bicycle we can offer technical information and guidance in order to satisfy your needs and of course your budget. – If your bicycle frame has corroded or has been damaged by impact we will be more than happy to assess it and offer a repair solution if possible. 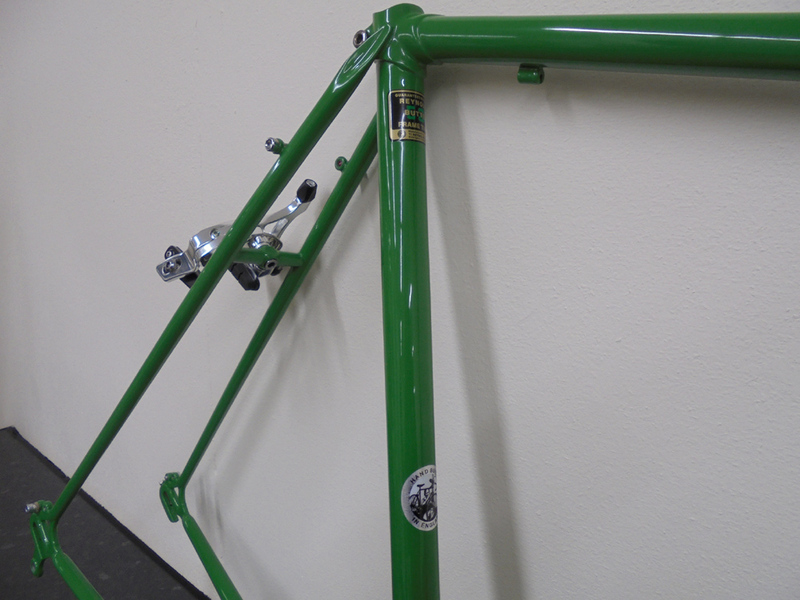 We have for example rescued many frames by carefully replacing damaged tubes, correcting any alignment issues and with new paint the look and integrity of the frame is restored. 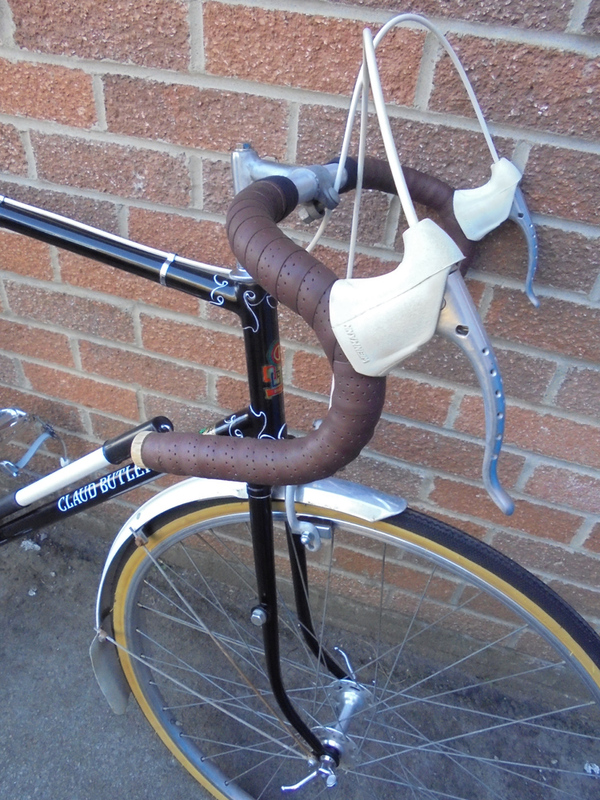 One frame offered for assessment had suffered impact damage to the top tube, this had almost totally crushed the top tube. 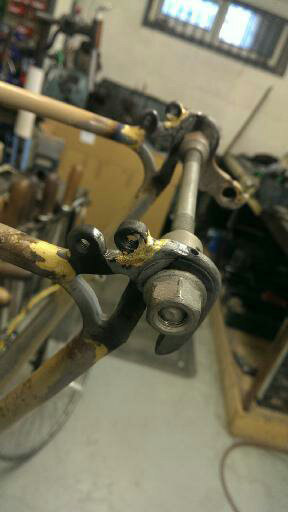 Secondly a badly corroded chainstay had been crushed and cracked as it had been used as a leverage point in hope to remove a taper fit chainset from its axle. 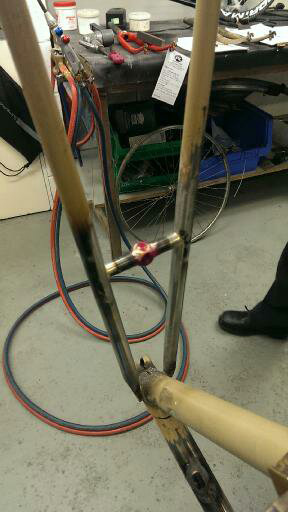 A slightly embarrassed customer was elated when told repair was possible especially when the repair also included a requested reduction in size to make the frame a correct fit. 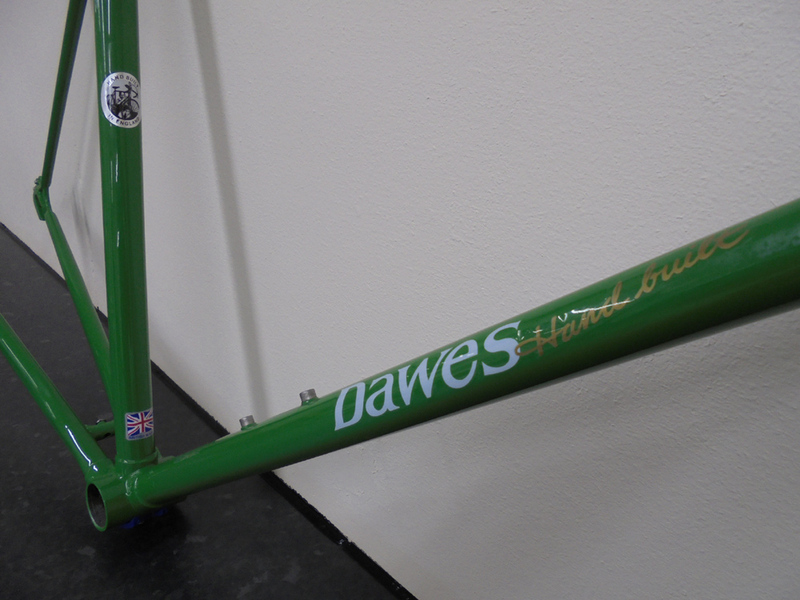 The frame's top tube, drive side chainstay and seat stays were carefully removed. 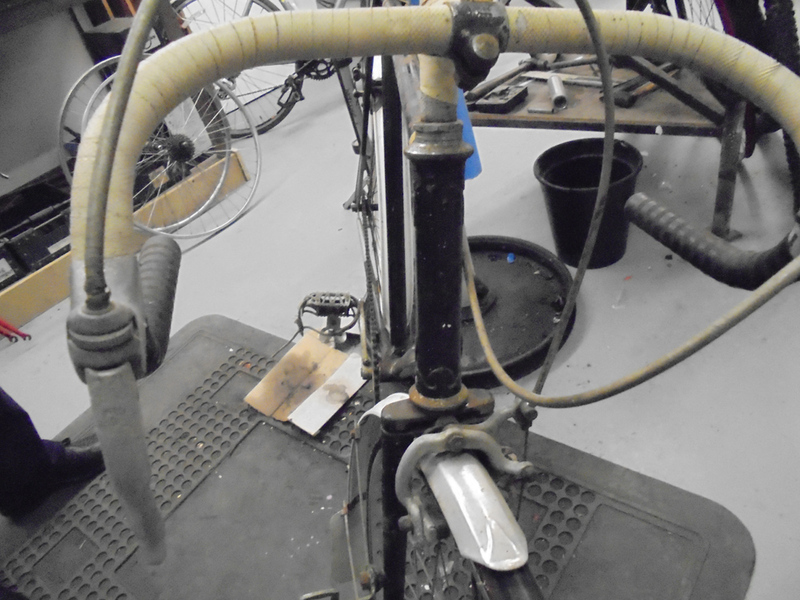 A suitable double butted top tube was mitred ensuring the horizontal aspect of the frame was replicated. 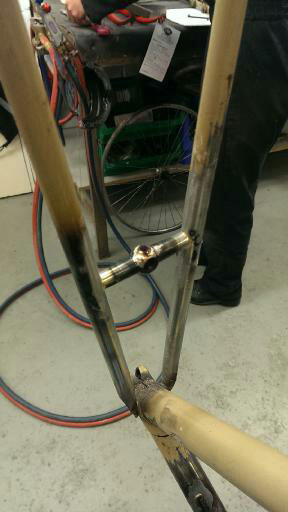 The new seat lug, new head tube lug and new top tube, once cleaned and fluxed were fitted to the remnants of the frame on the jig and brazed. 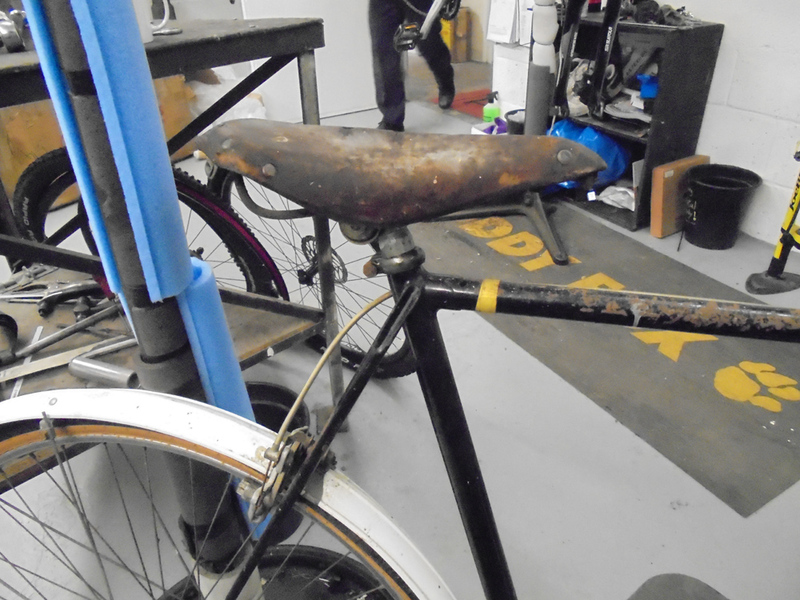 There was now an excess of material on the seat and head tube this could be removed. 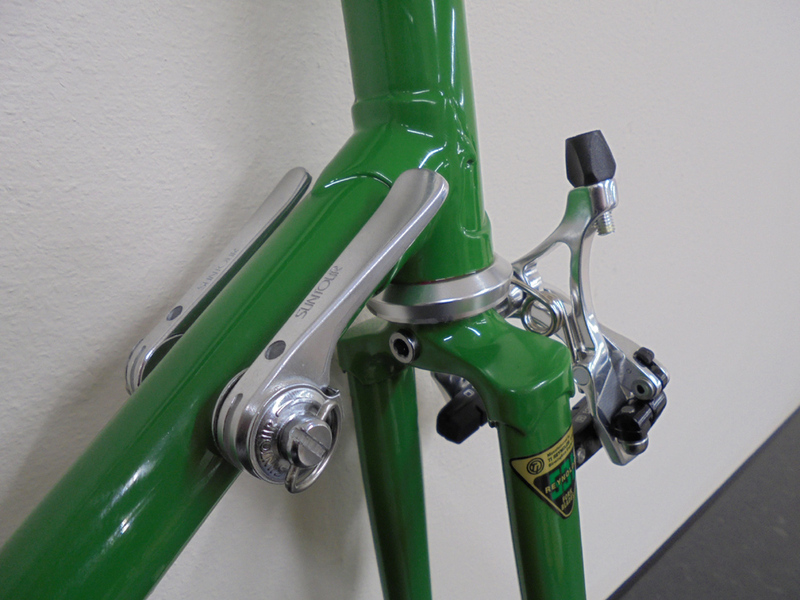 A replacement drive side chainstay was manufactured to dimensionally replicate the remaining left hand chainstay and duly fitted keeping the relationship with the bottom bracket as original. 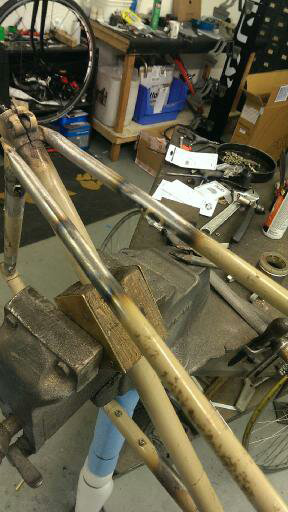 New seat stays made to the original followed and the frame rebuild was almost complete. 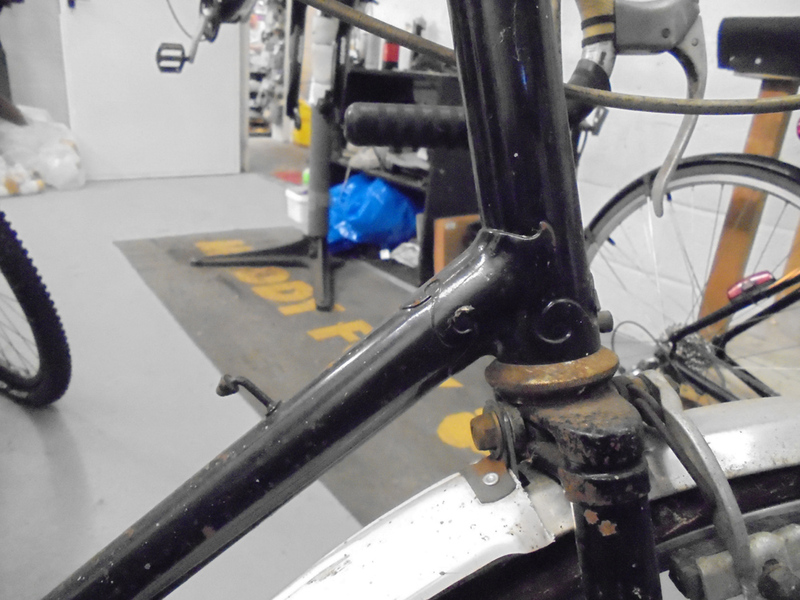 The photographs below highlight the frame discussed and other examples, demonstrating what repairs can be carried on your frame in house at Arthur Caygill's Cycles. 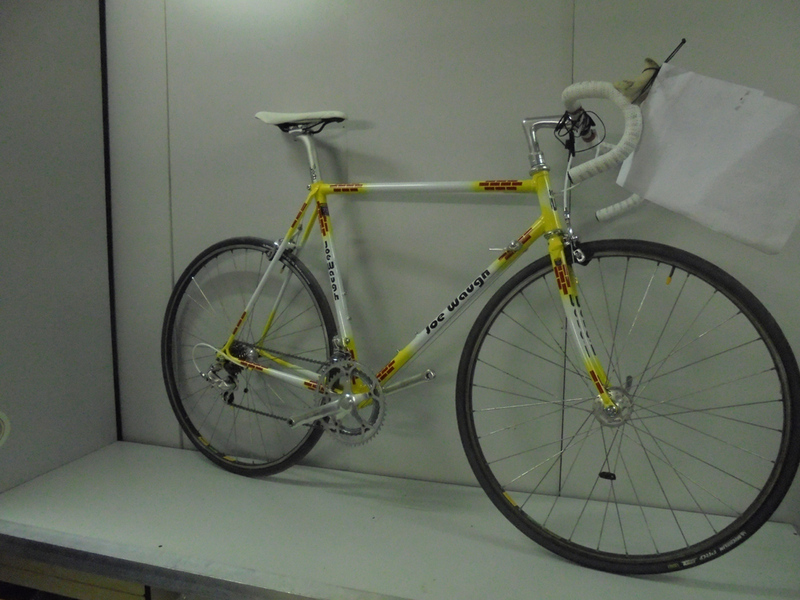 Please contact us if you have a problem and we will try and offer a solution, you may be surprised what is possible. 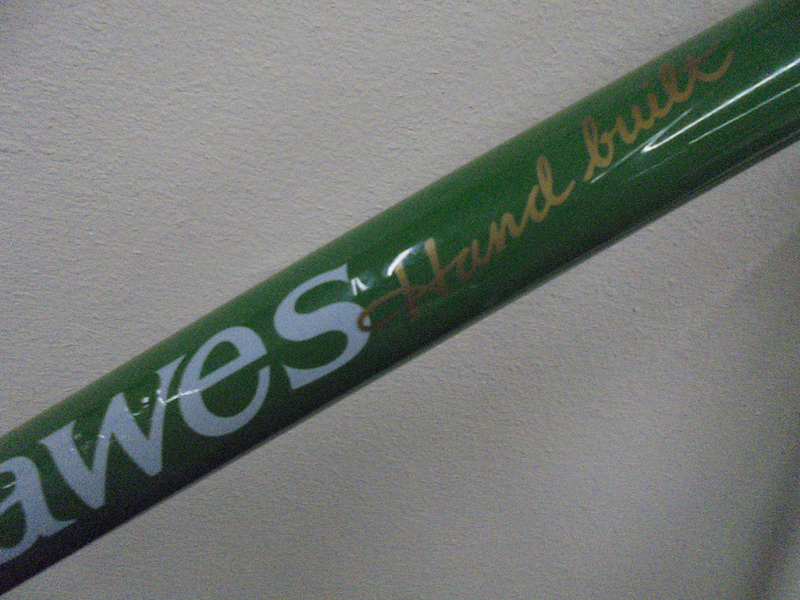 We take great pride in our wheelbuilding skills. 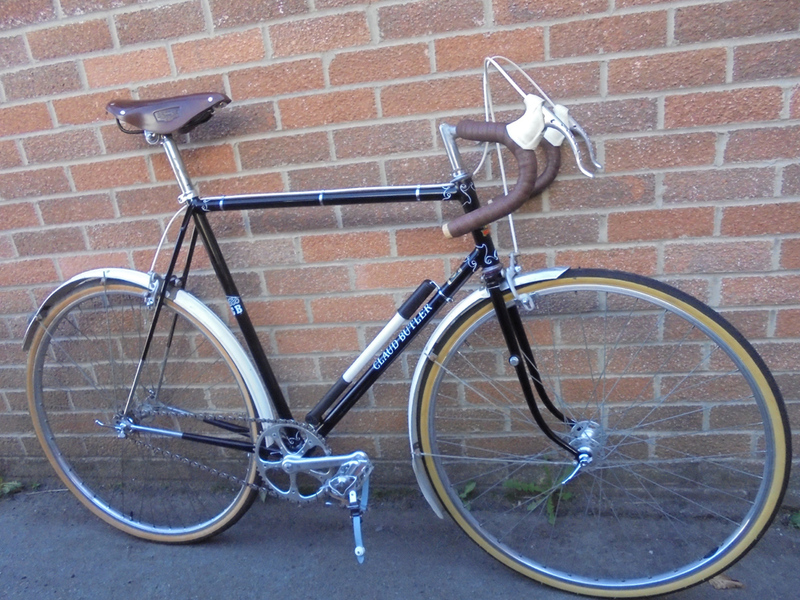 Whatever your discipline or for whatever purpose, wheels built by Arthur Caygill Cycles won't let you down. 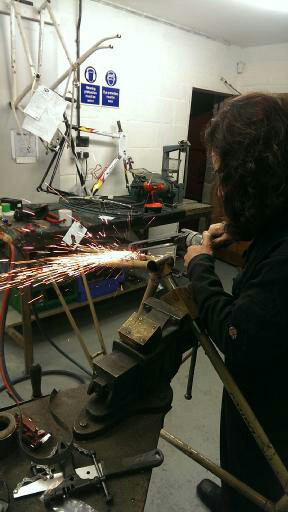 Arthur Caygill Cycles has been long established in bicycle frame building. 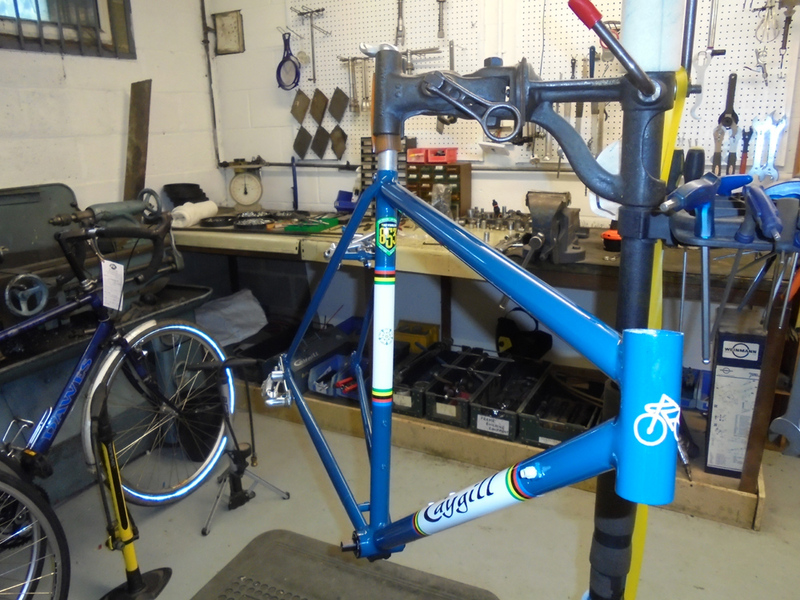 At Caygills frame building workshop we have additionally continued to offer a comprehensive range of associated services. 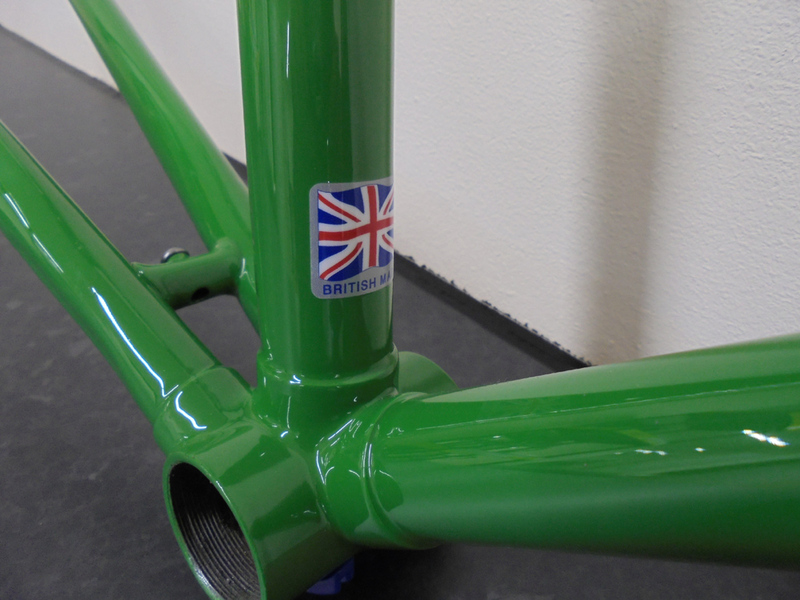 These services include frame repairs and renovation; where frames can be repaired and re-finished in their original colours and design or as desired by the customer. 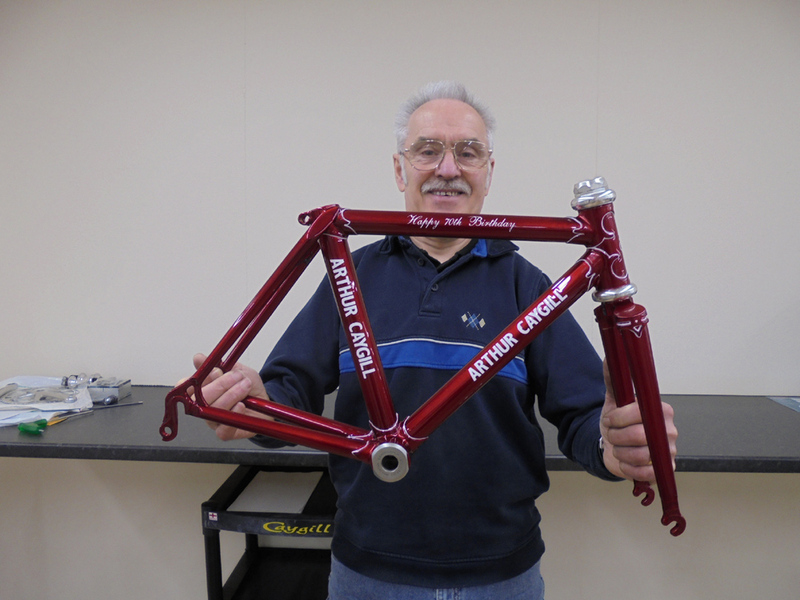 Caygills in 2017 has refreshed its frame re-finishing facilities; dedicating an in house area of the shop to this service. 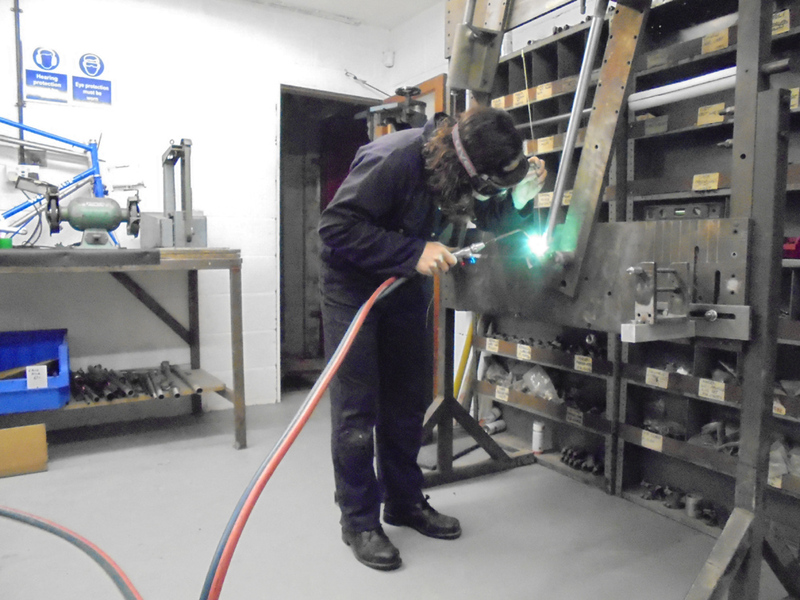 We have complimented the bead-blaster, used for many aspects of frame preparation and frame building facilities with a stoving oven, compressor and spray booth allowing Caygills to complete all aspects of frame building and renovations in house. 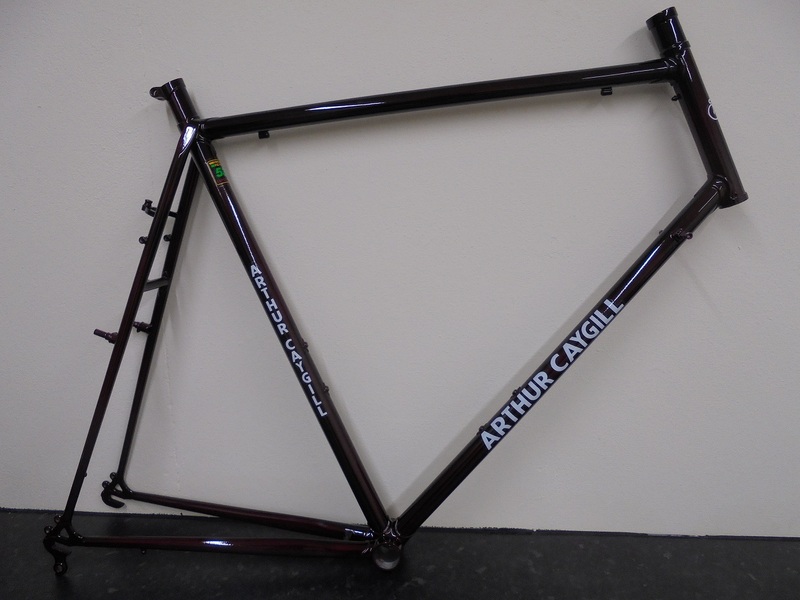 We believe this allows Caygills to provide a high quality frame refinishing service that matches our dedicated customer service. 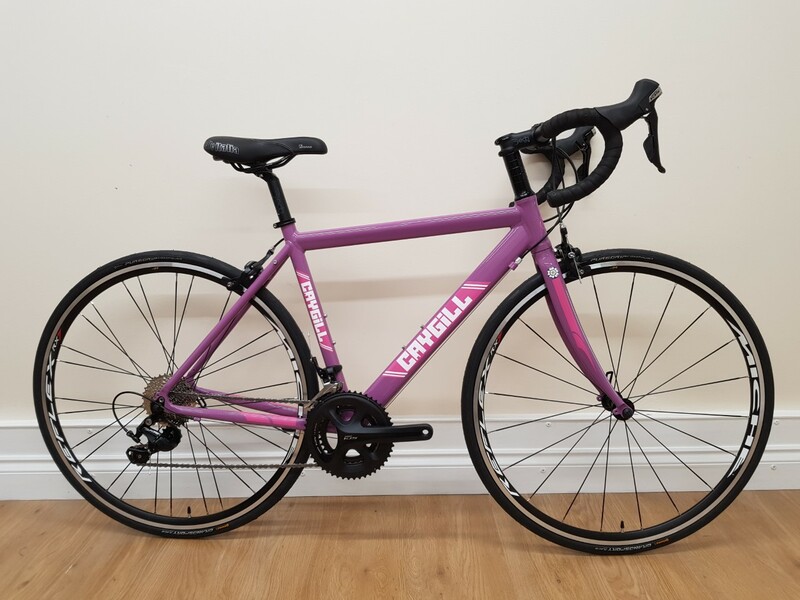 At Caygills we are of course happy to disassemble bicycles on behalf of the customer, equally we appreciate some customers prefer to do this work themselves, either way work required on the frame will be discussed and itemised on a individual worksheet to clarify requirements. 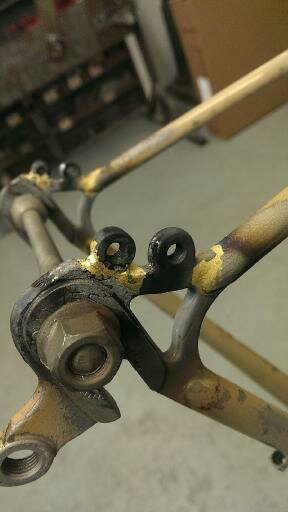 Frames are then cleaned and degreased, ready for paint removal. 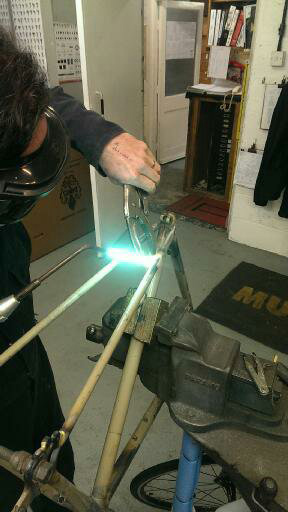 Preparation work strips the frame to bare metal or carbon for inspection and any repairs that are needed. 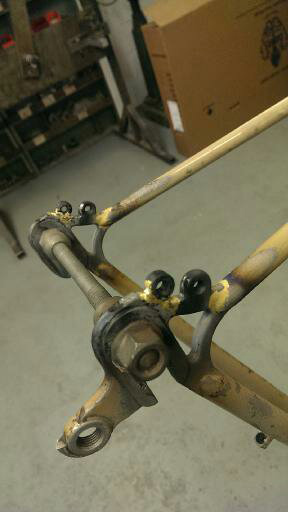 Once frame repair work is finished, further cleaning in readiness for the application of primer is meticulously carried out and as soon as the frame is clean it receives primer. 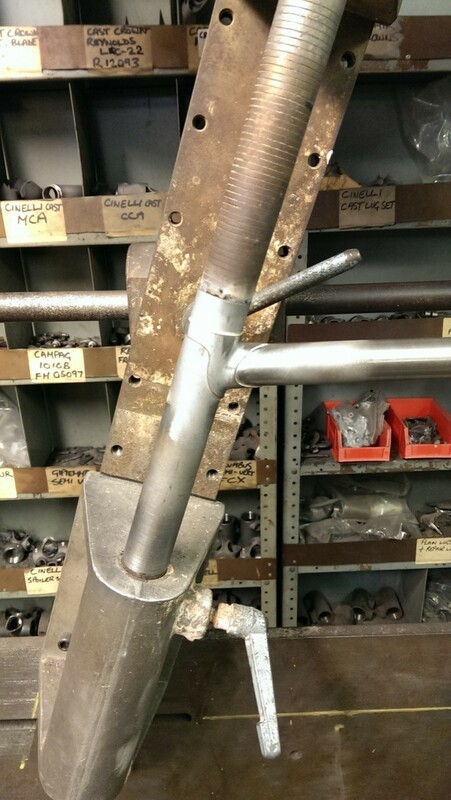 This is to minimise the time the host material is exposed certainly pertinent for metals. 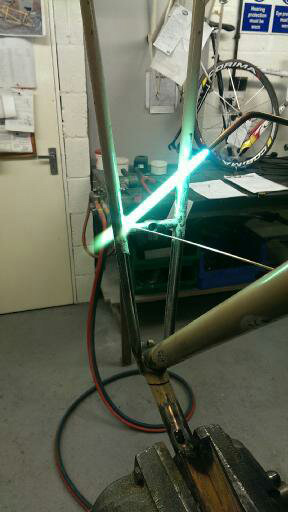 If appropriate the primed frame is now stoved (oven baked). 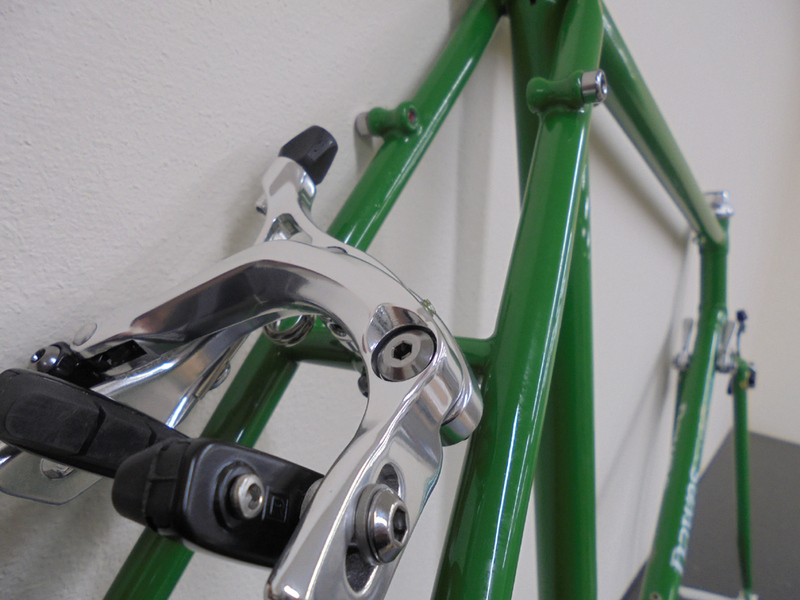 Dependent upon frame material and paint options frames are stoved, this process of curing the paint at selected temperatures is repeated as the undercoats, colour and clear coats (lacquer) are added, ultimately providing a resilient finish in the colour chosen. 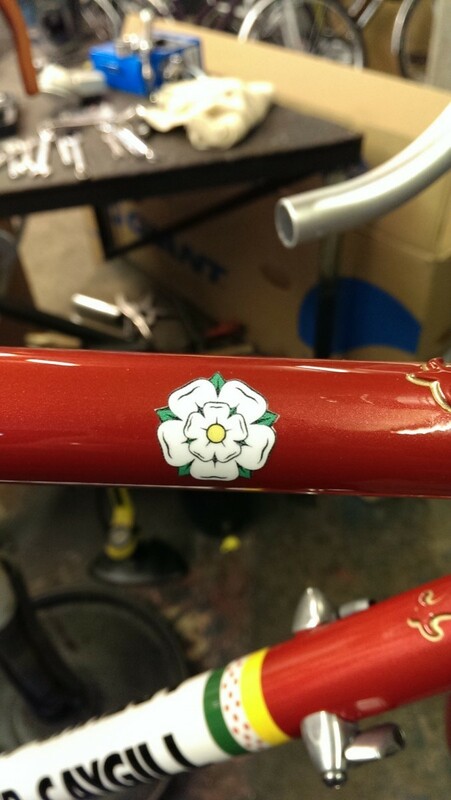 At Caygills decals and lug lining are added before clear coat to ensure they are also protected by the lacquer and remain in place. 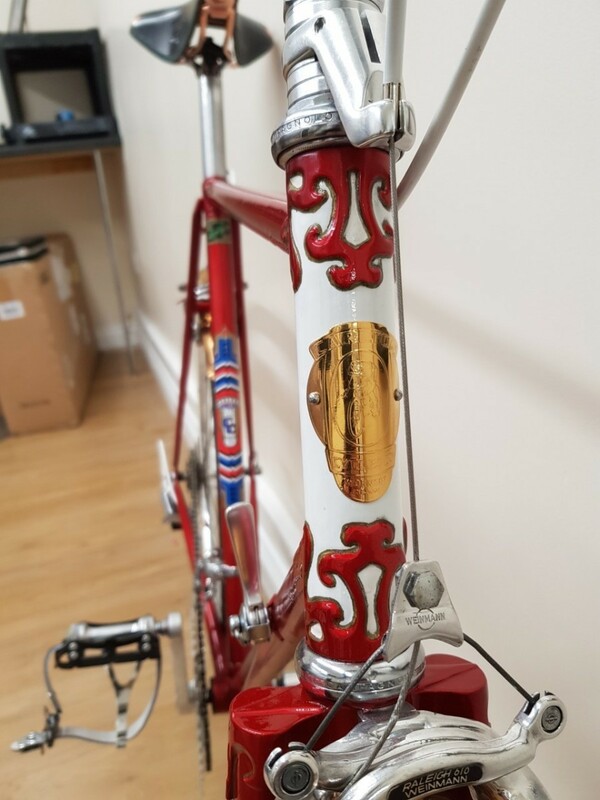 The refinishing of a frame will be very individual, with your various ideas to be discussed and Caygills will certainly endeavour to tailor the painting of your frame to suit you, such as polished drop outs, decal design and correct tubing decals for example. 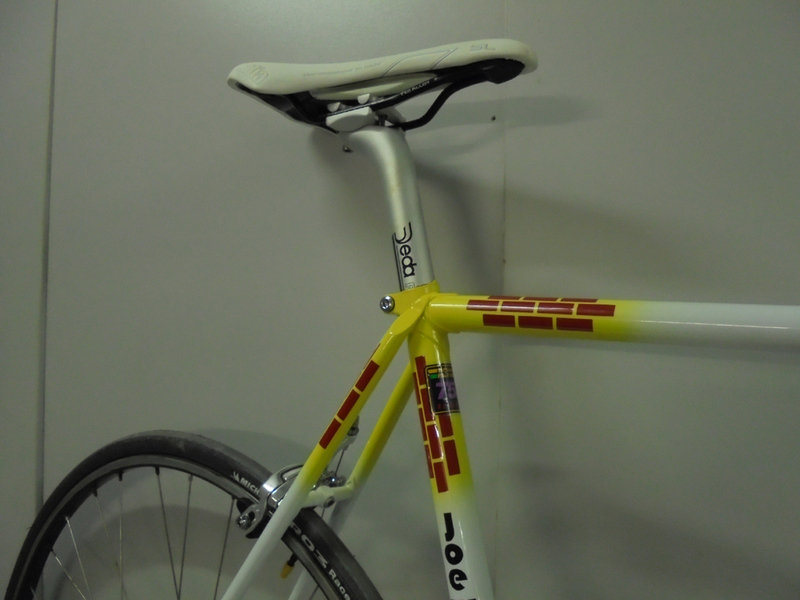 Whatever your respray ideas? 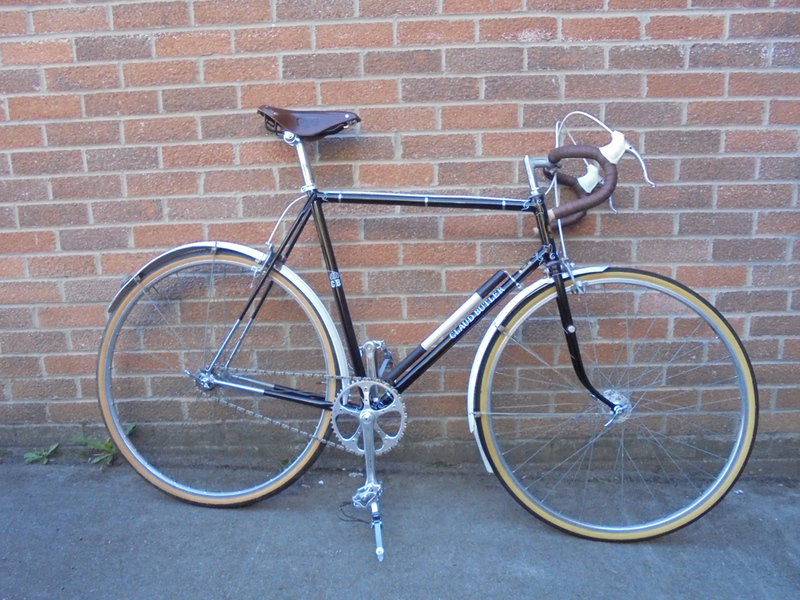 Why not come along to Caygills or call to see how we can help you bring your pride and joy back to life. 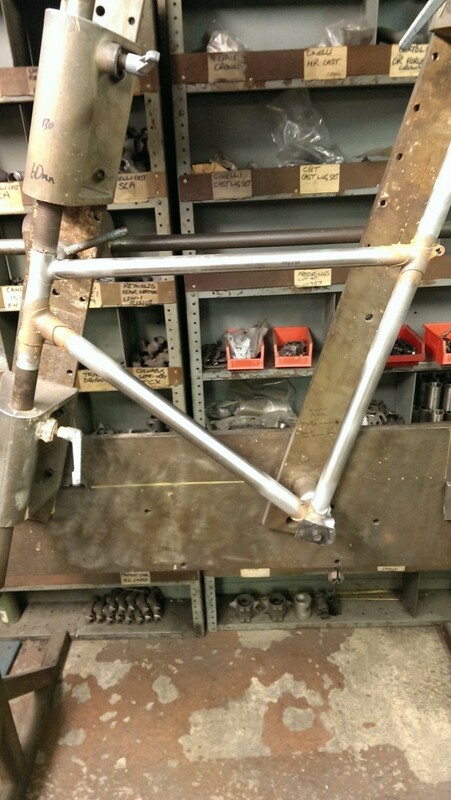 Here are some examples of recent frame Building and renovations.